When asked to describe their feelings about the federal government, 86% say either that they are frustrated (60%) or angry (26%). Just 11% say they are basically content with the federal government, by far the lowest percentage in a measure that dates to 1997. The share of Americans who describe themselves as angry with the federal government has nearly doubled since March, from 14% to 26%, while those who say they are basically content has fallen by half, from 22% to 11%. Anger with government had waned substantially earlier this year – in March just 14% of Americans said they were angry with government, including just 16% of Republicans, 15% of independents, and 10% of Democrats. Today, 28% of Republicans, 30% of independents, and 19% of Democrats say they feel angry at the federal government. In this regard, the current spike in public anger is notably broad-based. When anger rose to 20% in the fall of 2006, it was concentrated predominantly among liberal Democrats, with very few conservative Republicans expressing such strongly negative views. 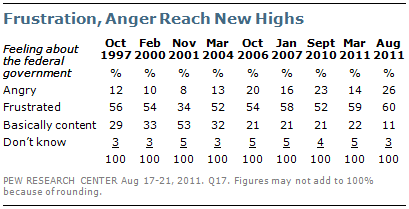 When anger rose to 23% in the fall of 2010, this pattern was reversed, with people on the right expressing the most anger. But today, this emotion is more broadly distributed. There is certainly more anger among conservative Republicans (32% angry) than among liberal Democrats (12%). But compared with a year ago, the political gap has narrowed as anger has risen among Democrats and remained high among Republicans. Across these three periods independents have grown consistently angrier, from 21% in 2006 to 27% a year ago to 30% today. 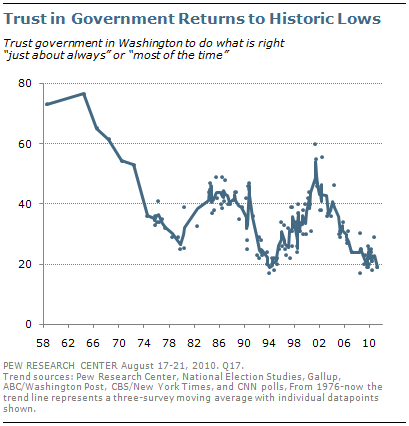 Similarly, public trust in government, which had recovered slightly earlier this year, has once again returned to deeply negative territory. In the current survey, 80% say they trust the government to do what is right only some of the time or never. Just 19% say the government can be trusted just about always or most of the time. When this question was first asked on the American National Election Study in 1958 nearly three-quarters (73%) of Americans said they always or mostly trusted the government to do what is right. Across all updates of this question over the past 53 years by the ANES, Gallup, ABC/Washington Post, CBS/New York Times, CNN and Pew Research Center, the all time low mark for trust in government is 17%, measured by CBS and the New York Times in October 2008 and by Gallup in June 1994.
poll finds just 38% saying they feel favorably toward business corporations, and just 41% saying the same about labor unions. Majorities felt favorably toward both of these groups as recently as 2007. And over the course of the past few years, these declining ratings for business and labor have crossed party lines. While Republicans continue to hold a more positive view of business corporations than Democrats, favorability has fallen significantly among both groups. 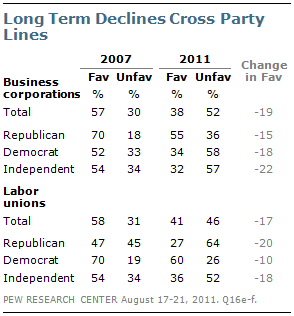 And independent ratings of business continue to track with the views of Democrats. Labor union ratings have also slipped across party lines, though the partisan divide here has grown substantially. Far fewer Republicans today offer a favorable assessment of labor unions than in 2007 (27%, down from 47%). The slippage among Democrats has been far more modest (60%, down from 70%). Independent views fall in between, having slipped from 54% favorable in 2007 to 36% favorable today. For more on views of labor and business see “Labor Unions Seen as Good for Workers, Not U.S. Competitiveness“.